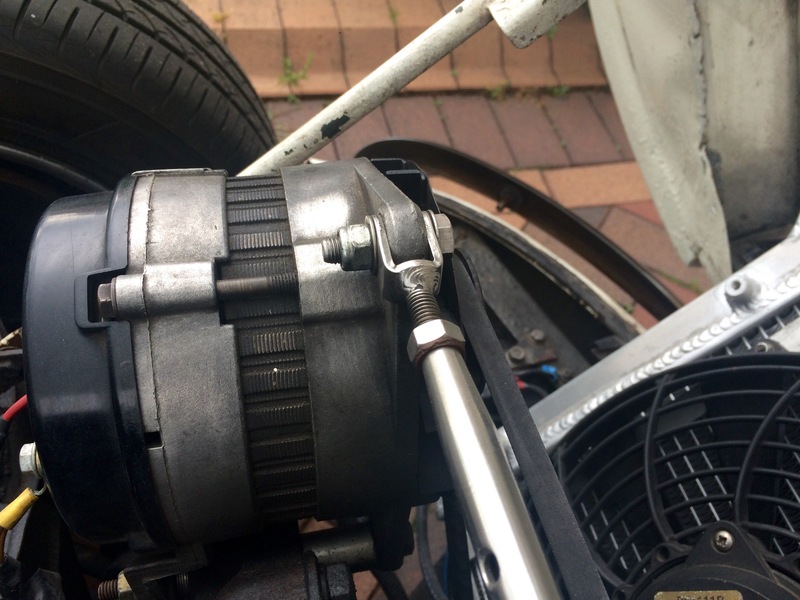 Problem: Years back when I first did an alternator conversion on the GT6 the very rudimentary ‘pull it hard and tighten the nut’ fan belt tensioning method really annoyed me. It seemed there should be a way to achieve finite adjustment, and not risk noisy, slack or dangerously tight belt tension. Solution: I don’t remember where now, but somewhere I saw a rigging screw (sometimes called a Turnbuckle). They are available in a load of sizes, lengths and materials from chandlers (sailing suppliers). So I used one of these to solve the problem. I then went on to sell them for a while on eBay under the name Mere Components. Type: The type I chose for this job has two ‘jaw’ ends which usually come with a removable pin. Other types of end available are hook, eye (round and oval) and swage, so be specific when ordering. Size: Rather fortunately there’s a commonly available 8mm size. 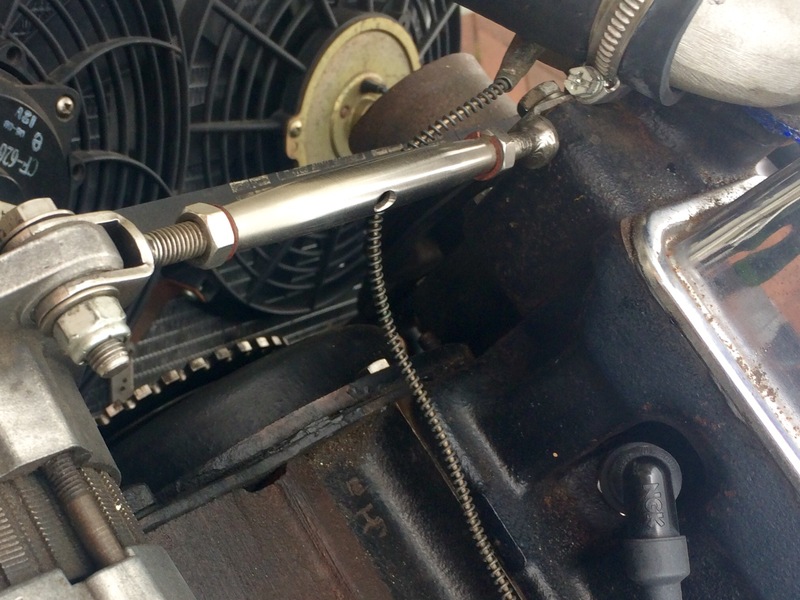 It has M8 threads, 8mm pin and 8mm clearance drilling in the Jaw, and the Jaw gap is also 8mm which suits the flange on a Lucas A127 alternator which you’re probably using… right? 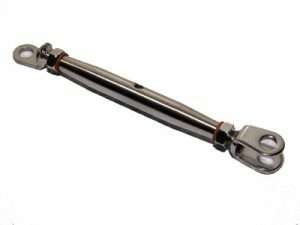 Material: Given that Turnbuckles are used in sailing, many are available in marine-grade stainless steel. Galvanised steel is available but… nope. Finally, the two nuts that came with the turnbuckle I bought were very weedy, so I found a ‘normal’ sized stainless M8 nut, and a reverse-threaded one, to replace them with. There are not nylocs, so two 5/16 fibre washers are performing locking duty. These pics are courtesy of Roy Lacey, showing the one I made for his GT6 as a prototype years back. 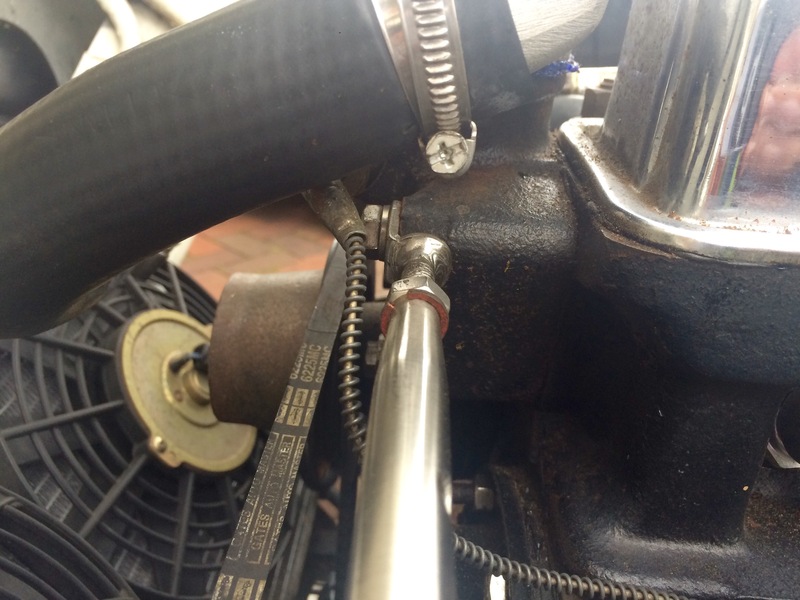 Great job on the tensioner! I’m looking to do something similar on a 6v to 12v conversion,on an old Ferguson tractor. I’ve seen numerous variations,but I like the jaw ends on yours. I’ve seen the jaw ends,but I haven’t been able to find a single sided one. I found Quillers,but like you said,it seems a bit pricey! Can you provide me the names of some other sources. I’m not opposed to buying the pieces individually and assembling my own. Glad you like it. I’m still running one on my GT6. As long as you check the ‘L1’ and ‘L2’ open and closed lengths listed there suit the Ferguson, and that the ‘E’ jaw gap suits the dyno/Alternator you’re using, I think you’ll be fine. If you can’t find reverse-threaded M8 nuts and suitable washers, let me know as I still have some knocking about.